are you one of my 315? During my morning Reader reading (remember when we used to read something called a newspaper? Ha! How passÃ©) I came across (Oh, well, yes I still do read a newspaper too. Anywayâ€¦) a blog post on Linked In allowing new applications to be integrated on to someone’s Linked In page. Very tight restrictions, as is the LinkedIn way but I went and saw a video about the apps to see if I wanted to add one or two. There was a Word Press app that I kinda understood and since my blog is a Word Press blog, I added it. Or I think I did, I’m not sure. Nothing really happened when I added it so you may see it on my profile or you may not. Sometimes my button pushing on computers is less than stellar. In real life I can be an excellent button pusher but that’s not always seen as a good thing. Any way, goodness such rambling todayâ€¦.the point I was trying to get to before these tangents in my head kept over taking my fingers on the keyboard was that I was surprised to see I now have 315 connections on LinkedIn. I didn’t think it was up that high but I also wasn’t following its growth like a tote board at a telethon either. I’m a pretty open connector / networker on LinkedIn, I guess a Lion or LION (their emphasis) is a group nickname for it. Yet I am not really aiming for the 500+ moniker, the magic number where LinkedIn stops tallying one’s connection count (I guess that makes me a bit of a remedial Lion, possibly the runt of the litter). Once you learn some tricks its really not hard to get heavily connected. I think its fine if somebody WANTS to do that but for me I always come back to one question. Strictly for purposes of example, I’m connected with a couple of LIONS who are Human Resource Managers (lots of those professionals live on LinkedIn it seems to me) who may want a shot at connecting with my contacts but I’m not going to likely do business with any of the HR folks. I sometimes wonder if I’ve made a (very minor with no disrespect intended) mistake simply accepting that kind of connection. Or maybe they’ll offer me a million dollar job that will change my life. Granted, LinkedIn allows you to use your database to communicate via email outside of LinkedIn in a professional way. I let people know in my profile that I will communicate with them in this way (although one person long ago evidently couldn’t read and accused me of spam; it was no one of any consequence anyway) and I do update these folks on my businesses. My goal though is to have my business communication mean something to them, to have it seem logical (i.e. “Oh, I have a video production company and this voice talent just sent me his newsletter and since we use voice talent on occasion, receiving this newsletter makes sense!”) Worse than being accused of spam, I would hate to be accused to wasting someone’s time. If LinkedIn is to have professional value to all of us (and certainly it can also have personal value as well) quality should be the prime directive not quantity. But if I get to 500+ contactsâ€¦.be assured it will only be because quality begot quantity. And if you actually read through this entire blog post, especially if you didn’t feel like commenting, just type in the word “finished”. Then I’ll have to think of some prize to give you for muddling your way all the way down here. I’ll start with saying thanks! And of course I want to connect with YOU. The tragedy in Myanmar (Burma) from the cyclones continues with this report being secretly produced and now broadcast globally by CNN. Like life itself sometimes, it’s tough to watch so be warned. And you can still donate to UNICEF here to help families in Myanmar (Burma). Anything you can spare would go a long way for them. MAY 31, 2008 –After having got the kids down for a nap on this grey, threatening Saturday afternoon, I was toying rather seriously with taking a nap myself. As always, I hypnotically found myself checking mail first, which on Saturdays usually doesn’t reveal too much that’s readable. Bilingual English/French Voice Talent Liz de Nesnera, who is featured as a voice talent on audio’connell’s International Voice Talents sent me an email that actually made me say “wow”. I thought maybe (you) could use a French version of the :30 PSA. She was referring to our public service announcement efforts (post1 – post 2) to aid UNICEF’s fund raising efforts in Myanmar (Burma). Unsolicited help from a thoughtful and generous soul with plenty of work on her plate already. And as I expected, a beautiful read indeed. This is yet another experience with my voice over peers where I realize just how deficient the words “thank you” really are. I don’t think it’s so far fetched to say greatness in a career starts with greatness in one’s heart. Clearly, Liz de Nesnera has a great heart. If you know of any French broadcasters of French podcasters, please direct them to this PSA. Click (or right click)here to download the the :30 PSA! Click (or right click)here to download the the PSA script! 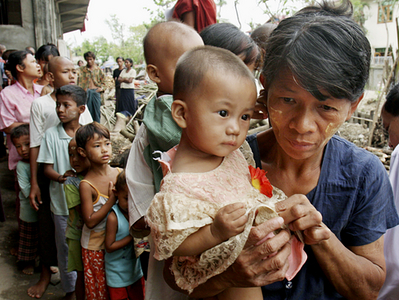 May 28, 2008 —UNICEF is making inroads with the Myanmar (Burma) government to provide aid for millions still affected by the cyclone that destroyed parts of that country. With updated statistics and a list of pressing problems for relief workers trying to aid children in the region, audio’connell Voice Over Talent has updated its :30 second public service announcement (PSA) for universal use. The PSA requests donations for UNICEF’s relief effort in Myanmar. Our original posts regarding UNICEF fund raising efforts in Myanmar can be found here. Please make known this PSA update to any broadcast, cable or internet contact you have. They may use the PSA as produced or use the script to produce their own PSA. The story may not be leading the news broadcasts today but the terrible conditions for the children in the country are no less severe. UPDATE (May 28, 2008; 11:45 p.m. ET)— We have updated our :30 PSA with current statistics from the disaster. Please use that update which you can find HERE. UPDATE (May 15, 2008; 7:56 a.m. ET)— UNICEF has now posted celebrity public service announcements on their You Tube Channel asking for donations to help raise funds for the Myanmar relief effort. Participants include Ben Stiller, Joel Madden, Nicole Richie and Tea Leoni. Please get these PSAs on the air. The military government has also allowed more relief workers into aid in the relief efforts but not enough to properly deal with the devastation. UPDATE (May 13, 2008; 12:30 p.m. ET)— The New York Times reports that relief efforts are still being blocked by the Myanmar government. If and when (please be soon) that the government lets relief efforts in, the donations to UNICEF are going to be even more critical because the problem of disease and death only gets worse the longer its ignored. Please keep pushing the PSA’s to any media outlet you can. UPDATE (May 9, 2008; 3:30 p.m. ET)— The web site Swiss Info is reporting that the United Nations will immediately resume aid flights to Myanmar and that one US Flight has been approved by the nations military government. Foreign aid workers are still restricted, though and I’m not clear how they plan to handle the issue of the government stealing UN relief supplies as reported earlier. May 9, 2008 –The United Nations said it would suspend all further aid shipments for survivors of last week’s devastating cyclone in Myanmar after the country’s ruling junta seized all aid material that had been flown in so far. The U.N.’s World Food Program “has no choice” but to suspend further shipments until the matter is resolved, WFP spokesman Paul Risley said. All “the food aid and equipment that we managed to get in has been confiscated,” he said, including 38 tons of high-energy biscuits. The New York Times has its report here. The UNICEF web site is still taking donations. My assumption is that at some point aid will be given and that funds will be needed. In the worst case, no funds donated will be able to be used in Myanmar BUT will be used to aid children when another international disaster strikes. The US Fund for UNICEF needs our financial support; let’s move forward and continue to promote this cause. Hopefully we’ll be ready to help Myanmar when allowed in. Frustrating as it has been for all nations, including the United States, to immediately get food, water and medicine into the areas of Myanmar ravaged by the recent cyclone, the challenge of having to pay for all the needed relief in the weeks, months and maybe years to come is going to be even more of a headache. Today UNICEF issued an emergency appeal for financial contributions to help pay for all that will be needed. UNICEF is working with Myanmar’s (Burma’s) military government to coordinate relief efforts. It occurred to me that UNICEF will need to promote this fundraising appeal. My personal experience with non-profits is they don’t always execute communication plans as fast as possible because of restrictions on manpower and money. I hope UNICEF proves me wrong and if they do get audio and video spots out on this appeal, ignore and delete what I am about to do. I’m stepping in to what I assume will be UNICEF’s eventual communications plan for Myanmar fundraising without an invitation and without approval. Screw politics and procedures. I’m a broadcaster and this is the internet. Attached are two public service announcements (PSA); one sixty seconds long, one thirty seconds long both explaining how to donate funds for the cyclone relief effort directly to UNICEF. The scripts I wrote (also attached) were based on text lifted directly from the UNICEF web site dealing with the Myanmar relief effort. audio’connell Voice Over Talent is not receiving any compensation for this, we don’t want anyâ€¦nor are we looking for publicity for us. We DO want publicity (and lots of it) for the PSA’s themselves and ask that if you directly know any radio station or television station program directors, internet radio stations or podcasters, please direct them here or email them the spots or scripts (if they want to record spots with their own voice talent, God bless ’em!). PSA’s don’t do any good if they don’t get played and if people don’t respond to the call to action. Please promote the availability of these spots within whatever professional network you are a part of and encourage their use to help raise money the people in Myanmar who have been so terribly distressed. And if you could throw UNICEF a couple of bucks in the effort, that would be good too. Please note in the comment section of media to whom you have sent this to or (if you’re the media) what outlet you are from. Thanks for being a good person. Click (or right click)here to download the the :60 PSA!